I got the wind knocked out of me last week when I was grocery shopping. I went to the meat cooler to grab some pepperoni and happened to glance down at a beef roast. Do you know how much that roast was? $37! For 1 roast! Let me be clear, I’m very willing to pay a premium price to support the work of a local farmer who cares about the health of my family and pours their heart and soul into producing good food. But let’s face it...a family can only afford so many $37 roasts per year before the checking account is empty. It really opened my eyes and made me realize what many families are dealing with. I know how expensive it is to raise and feed a family and meat easily has to be one of the biggest expenses. I think we can all agree that we don’t want to feed our kids meat that was raised with antibiotics, hormones, and cancer-causing chemicals. We want to support farmers that honor and respect the lives of the animals they care for and who are working to truly be good stewards of the land. But with this massive price tag I can see how that’s not always possible. The whole point of us farming this way is to make wholesome, healthy, trustworthy, humanely-raised food accessible to our community. But what good is it if you can’t afford it? That’s why we sell our meat in “bulk” - by the quarter/half - so you are able to actually afford top quality meat and can feel good about feeding it to your family. Buying in bulk can be scary your first time so I’m going to walk you through the entire process. We raise 100% Grass-fed Beef, Pastured Pork and Pastured Chickens all without antibiotics and hormones. We accept cash, check, and credit cards. This deposit gets applied to your final total cost. In the past we have used Schmidt’s Meat Market in Nicollet for local orders and Odenthal Meats in New Prague for metro orders. The cheat sheet covers the questions the butcher will be asking you when you call in your cutting instructions. This gives you an opportunity to figure out things like how thick you’d like your steaks cut or decide if you want brats or breakfast sausage made. This is the weight given to us by the butcher after all the inedible parts are removed (head, hooves, carcass etc). This is how we determine the final price for your meat. Your deposit is then subtracted from this total amount. It will be frozen so you’ll need to make sure you bring coolers to get it home. You are also in charge of paying the butcher for their hard work cutting up and packaging your meat. For easy math, you can figure about $1/pound. So let's get down to the most important part...Cost. To see what this looks like in terms of cost let’s look at a beef example. Depending on your cutting instructions, the hanging weight will be a bit less as they may remove more bone or trimmings, so we’ll figure actual take home to be about 85% of hanging weight. This comes to about 160# meat. Grand total paid = $878.75 / 160# of meat = $5.50/# of meat. Way more affordable than buying meat by the individual cut. This means you are getting grass-fed T-bone steak for $5.50/pound. How do I know how much to get? It’ll depend how much you cook and how big your family is. I cook a lot. I figure we eat 2 meals/month at a restaurant which leaves 88 meals for me to prepare. 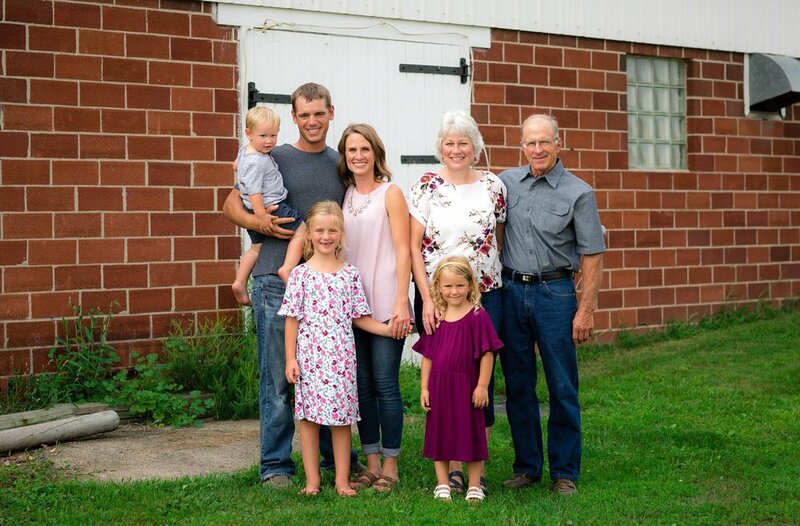 We are a family of 5 and we go through ½ beef, a whole hog, and about 45 chickens/year. These are approximations…and p.s. I'm not a mathematician. We have a 16 and an 8 cubic foot freezer to hold our meat and we still have room to spare. How long does the meat last? Beef and chicken will last for a year in the freezer. I’ve read that pork only lasts 6 months in the freezer, but I beg to differ. I make sure I have enough pork in the freezer to last a year and I’ve never had an issue with the way it tastes after 6 months. I get lots of emails in the middle of winter asking if we have any meat for sale. We don’t and we never will. We’re so crazy committed to making sure you get the healthiest, tastiest, highest quality meat possible that we will only butcher when the animals are out on fresh pasture and the grass is exploding with energy like this. Unfortunately, there’s no way around it - we all need to eat. When you are buying high quality grass-fed meat the price tag gets super high very quickly. But buying in bulk is without a doubt the most economical way to do so! If you found this information helpful we'd love to have you join our community at Nature's Pantry! As a thank-you, you'll get even more tips on how to eat well on less $.